I am a self-professed gallery wall fiend! I know that I tend to be a "busy" decorator, and gallery walls are the best way to satisfy my need to fill every space. Minimalism is just not my thing friends! A gallery wall is great because it can allow you to fill a large space over time without having to spend big bucks on a large piece of art, especially if that's not your taste. There's nothing more sad than a small, wimpy frame centered alone over a sofa. 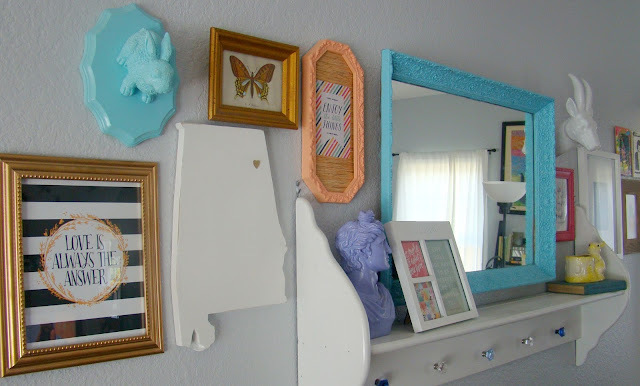 On the other hand, hanging a mixture of frames, shelves, and other decorative elements allows you to introduce some texture, color, and interest that you can't always get from one single piece of artwork, and you don't have to break the bank. The downside of a gallery wall is that it can become overwhelming to get all of those elements just right. I know the wall over our sofa is straight up swiss cheese from where I've moved things around so much. 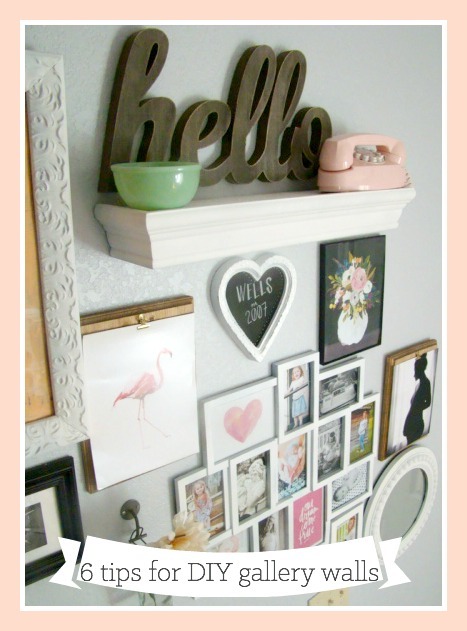 Here are my tips and tricks for fun, curated gallery walls on a budget. I have made the mistake in the past of just throwing things up on a wall without any real idea of the finished look I was going for. Sometimes that is out of necessity since it can take months to collect the right items for a space (and I am impatient). What has worked for me is to find a general shape or flow I like. I start from there, and then work my way out. The best way to plan the layout of your frames is to create paper templates. When I re-did our hallway "Wall of Love" as we call it, I used an old roll of art paper and traced every single shelf and frame and cut them out. I labeled them with a note so I would remember which rectangle I was looking at ("small scalloped frame" for example), and I made a mark where the hanger on the back was. Then, I hung the templates on the wall with painters tape. It allowed me to move the different elements around without destroying my fresh paint job, and I was able to get a better feel for the spacing of everything and the overall look. It was incredibly tedious (I have over 50 different frames and whatnot hung there!) but so worth it because, for once, I was able to get it right the first time. In order to tie in all the different elements of your gallery wall, choose a cohesive color story to repeat throughout. 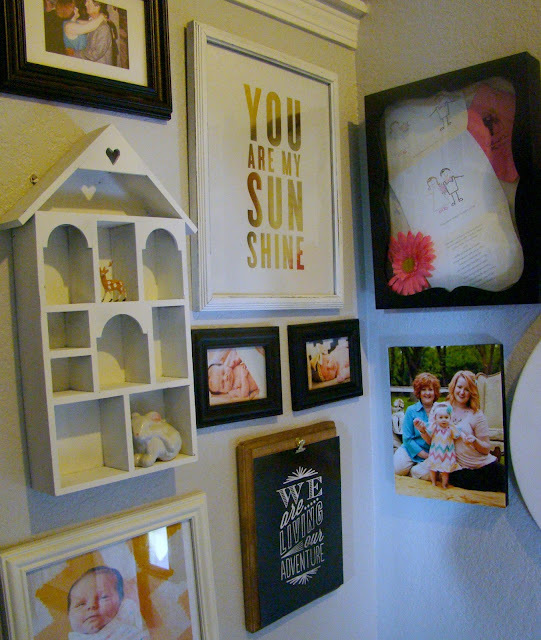 Our hallway Wall of Love uses chalky white, black, and natural wood tones with pops of coral and gold. We repeat it all the way up the stairwell, so even though there are over 50 individual pieces, it works as one [gigantic] statement. Most people know that the thrift store is an excellent source for photo frames, but I'm including it anyway. Pretty much all of my favorites came from our local secondhand shop. Hit up the thrift store then bust out the spray paint! And don't worry if the art inside is an ugly teddy bear squeezing a heart and the saying "A friend loveth at all times." You can cover that up too! 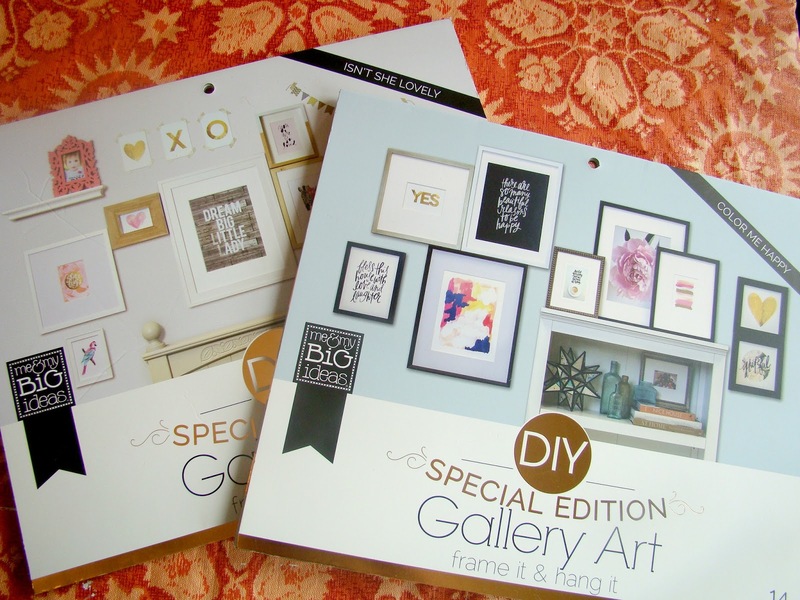 My favorite resource for new art is the scrapbooking section at Hobby Lobby or Michaels. I buy the giant 12x12 pads of scrapbook paper and use those as backgrounds in frames or as the art themselves. 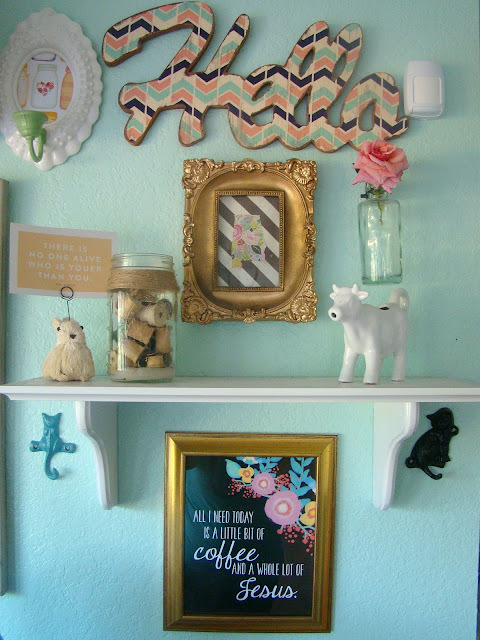 With a little Mod Podge and an interesting frame, you have new art! Lunch tray + scrapbook paper = Art! Another favorite that I've found at Hobby Lobby are the pads of ready-to-frame prints by Me & My Big Ideas. If you use a 40% off coupon, you can get one of these babies for less than $10. It also includes ideas for placement and arranging. They sell a variety of frames in the store too, but those costs add up. 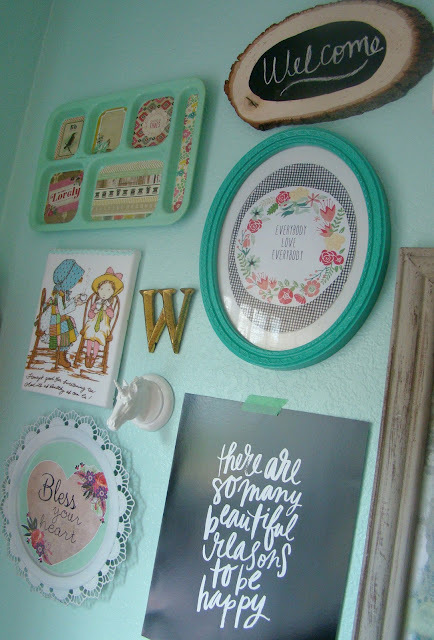 I have one of these prints stuck to the wall with green scotch tape right now, and I love it (washi tape works too!). I mostly used these to tie in color in the Wall of Love. If you're pressed for time, or just having a hard time creating the art yourself, try searching Etsy for art prints. Usually these can be printed right from your computer at home (I usually use high quality photo paper for mine). Some of my favorites are these flowers and this quote from Printable Wisdom. Only five smackers and you download it instantly! Plus, you own that file, so you can print as many copies as you need (for personal use, obvs). That means alllll your friends get framed art for Christmas this year! I have also bought lots of other fun art prints from Etsy that were shipped to me, including Frida Kahlo, Doctor Who and Breaking Bad themed prints. 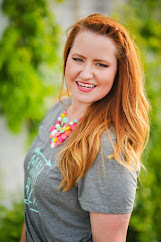 You can also search Pinterest for free printables. or a hanging vase or mason jar. I'm especially proud of the painted crate I have in my kitchen. Most of all, have fun! Don't be afraid to experiment with the placement and colors and nontraditional elements on your walls. 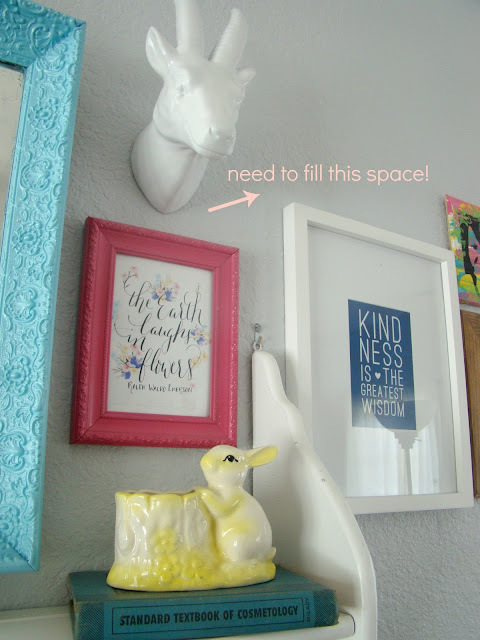 I hope these tips will give you some fresh ideas for your own gallery walls. 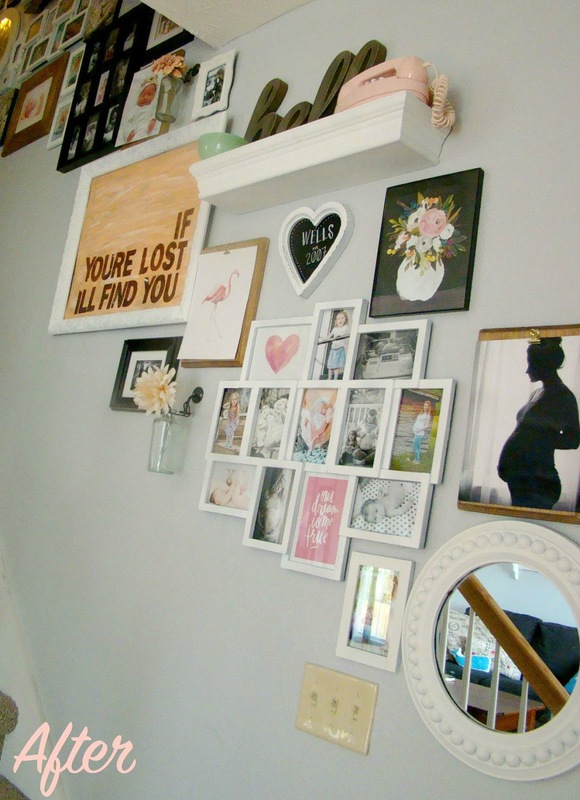 Do you love the gallery wall trend? Are you a busy decorator like I am? 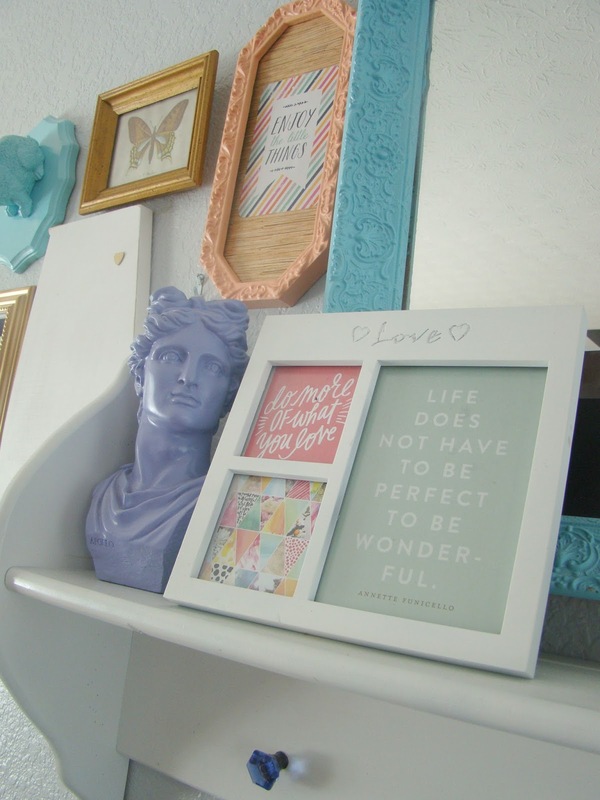 What's the weirdest thing you every hung on a wall? Thanks! Funny thing is, I originally got that as a gift for a friend, and had to have it in my own house!